Last week when Drew was working on his latest revisions for his dissertation, Justin kept wanting Drew to play with him, but he couldn't at that time. Since there's no where for Drew to escape to when working, Justin and I went to Shoppers. I needed to buy a few things anyway. As I walked past the items on mark down, I saw a box of Lucky Charms for $1.50. In order to save money, I rarely buy cereal, but since St. Patrick's Day is coming up, I decided to splurge. Line a 13 X 9 pan with parchment paper. Remove the Green and Orange pieces from the Jelly Belly's bag and set aside. Give the rest to your children to eat. After butter is melted, add the mini marshmallows. Stir until melted. Add Lucky Charms to butter-marshmallow mixture. Stir until well coated. Once everything is thoroughly mixed, press the Lucky Charms mixture into the pan with a buttered spatula. Cut into bars once cool. What's your favorite treat? Hope you find these magically delicious! These look amazing! We love Lucky Charms and think these are perfect for an Easter treat! I love cereal and marshmallow bars. Lucky Charms would be perfect for St. Patrick's Day. Cute! I'm not a huge fan of marshmallows but I can see how these would be a crowd pleaser. My favorite treat are bars made with almonds and coconuts called Swedish Bar Cookies. They are delicious. 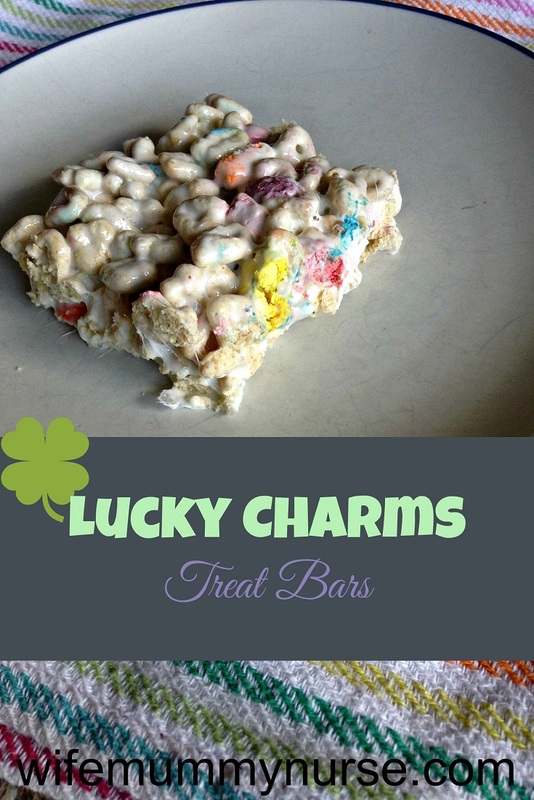 I know my grandchildren would like the Lucky Charms bars. I LOVE Lucky Charms! These look delicious! I have trouble making Rice Krispie Treats so I have doubts that I could make these. And yes, I have a masters degree. Sigh. kristiedonelson(at)gmail(dot)com Thank you. My kids will love this! Thank you! These look tasty and lots of fun! I just made rice krispy bars the other day. This is a nice twist on that. Bet the little ones love it! My family LOVES cereal and I think they would love these :) Thanks for the recipe!